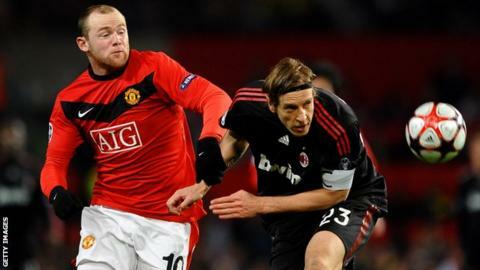 AC Milan are in talks with Manchester United about playing a friendly in the new year. Neither club is in the Champions League or Europa League this season and they could play each other in a one-off game in 2015. AC Milan's director Umberto Gandini said: "This is something we have been talking about for a few weeks and we have a committed interest to do something together." A date and location is unknown. United manager Louis Van Gaal said earlier this month that he wanted his team to play top teams in midweek and had spoken about it to United executive vice-chairman Ed Woodward and managing director Richard Arnold. United won the Champions League as recently as 2008, but their seventh-place finish last season under David Moyes meant they missed out on European club football's premier competition for the first time in 19 years. More than 100,000 fans watched United's 3-1 friendly win over Real Madrid in Michigan this summer during the side's pre-season tour of the United States.